National President of the Southern Kaduna Peoples Union (SOKAPU), Barrister Solomon K Musa says Governor Nasir el-Rufai’s attempt to change the narrative of the killings by Fulani herdsmen taking place in the area is a sad commentary and revision of history. 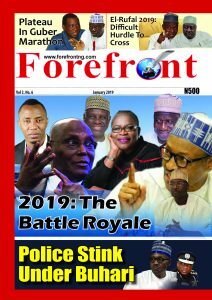 In an interview with Forefront Editors, Musa says it is clear that el-Rufai hates the people of Southern Kaduna with passion as shown in his deliberate act of criminalizing victims of the wanton killings. He emphasizes the need for Governor el-Rufai to shed the toga of partisanship for that of a patriot and statesman. What is the real situation on the killings in Southern Kaduna? Well, if you are talking about the real situation, it is a very difficult and tough question, because the situation is grim, harrowing and distressful. We are not even talking about the number of people that have died, but that we have a government in power; a government that chooses to stand arms akimbo, doing nothing, while its citizens are being mowed down, killed and decimated in large numbers. On the situation you are asking about, several villages and villagers have been destroyed, and displaced. We now have a serious humanitarian crisis on our hands, because people who were born and bred in the villages do not have any form of shelter they can call their own. They have become Internally Displaced Persons (IDPs) in their own country. Property worth colossal sums have been lost, and needless to say, several lives have been lost. To add salt to injury, Southern Kaduna is being economically destroyed because there is no activity going on there at present. Schools have been closed down and a lot of other things are in shambles. It’s quite grim. There is the other side of the story that the attacks are reprisal in nature. What is your take on this position? Honestly, it is laughable. This is because if you look at the narrative, some people are bent on changing the story. It’s easy for someone to talk about something that took place 100 years ago. But we are talking about something that took place within living memory. According to Governor Nasir el-Rufai, the people of Southern Kaduna killed 600 to 1000 transhumance Fulani who were caught in the mire of the 2011 post election crisis. The story can be cross-checked. It is within public domain. It’s laughable because newspaper reports, including Daily Trust, and reports of independent bodies like the Human Rights Watch are completely opposite. They affirmed that the killings in 2011 started in 12 Northern states, and not in Southern Kaduna. With regards to the killings in Southern Kaduna, it started in Zaria, in the northern local governments, not in Southern Kaduna. Incidentally, even the General Agwai’s Committee Report, all unanimously agreed to this fact. Now, if you look at most newspapers’ reports, they agree that the number of people killed in the entire 12 Northern states was 800, and that in Kaduna, the figure was 180. This happened within living memory. Unfortunately, the narrative has been changed by Governor el-Rufai, who is saying that it was 600 to 1,000. The reports also mentioned that the killings started when the results of the elections began to trickle in, and the supporters of General Buhari, then saw that he was losing, and they trooped out and began a killing spree. So, to say that the killings were reprisal is a sad commentary and unkind revision of history. Secondly, another group that claims it was a reprisal is the Miyetti Allah Cattle Breeders Association. One Haruna Usman came out to say it was a reprisal, and up till today, no one has come out to refute this position. So, suffice it to say it was not a reprisal attack, because reprisal involves prior offence. But let’s assume, without conceding, that it was a reprisal, and 180 lives were lost, why will the reprisals come now, since 2011? Now the killings have heightened, are they not satisfied with the level of damage and killings? Close to 200 lives were wiped out in Bondo alone in one night. When will the so-called reprisal stop? Is it when they have killed everyone? Is it when it gets to the Rwandan level of 800,000? With very great respect to the proponents of that argument, the points are arsenic. You can’t change history within living memory in that absurd manner. As President of SOKAPU, has your organization deemed it fit to meet with the government of Kaduna State or the Federal Government on this issue? As soon as we were elected late November 2015, but starting effectively January 2016, one of the things I told the world was that ours was a community development association, and that we will partner with government and we will also pray for government. The success or failure of government is ours too. Let me speak from the spiritual perspective as well. We believe that all governments have been set up by God. We believe anyone fighting government may actually be fighting against the will of God. So, the first thing we did in the first three months was to write to Kaduna State government requesting to pay a courtesy visit on the governor. That letter was never acknowledged. When this crisis began, we made some moves to see government functionaries privately. For the governor, that never worked. In October 2016, we decided to write again. I met the deputy governor and told him we wanted to pay a courtesy visit. I believe in diplomacy. I believe it’s only when the door is firmly closed one can go to the court of public opinion. As we speak, we never received even the courtesy of an acknowledgement of the letter. Supposing, we are a group of mad people, I expect the government to diplomatically or out-rightly decline to see us. But we have now been able to understand why. The governor came out on Channels Television to say that he does not recognize SOKAPU. This is a union that has 53 ethnic nationalities registered with it. It is an umbrella organization for the whole of Southern Kaduna people, yet the governor does not want to see us. Well, we do not know who he sees. How would you describe the Governor’s position on the Fulani herdsmen saga? Unfortunately, the governor has played less than a salutary role. One of the contributors on Channels TV said the governor is now the spokesman of the terrorists. You see, when this crisis started, we actually began by commending the government for the proactive measures it took regarding security in the state. When the government of Nasiru el-Rufai came on board, among the greatest menaces was cattle-rustling. The governor synergized with three or four other governors and, I believe with some support from the federal government, firepower was released, and the cattle rustlers were decisively dealt with. So, the operation on cattle rustling was quite decisive, but now we are telling government that it is human lives we are talking about here in Southern Kaduna. Human lives are far more precious. We see the American government or Israeli government going to war over one person. We are saying, come and replicate that same concern you showed in Zamfara in Southern Kaduna. We were saying deploy security to the flash points – the caves and the mountains – where these people are always coming from, and ensure they are routed. We kept on crying to no avail, up till December last year, nothing was done. The governor is the State’s chief security officer. Secondly, here is a man who was concerned about cattle, yet human lives seem to mean little to him, inferring that what is good for the goose is no longer good for the gander. Instead, the governor comes out to say the attacks are reprisal in nature; he comes out to insult us, to intimidate us, to criminalize the victims. His comments have been inciting and incendiary. It appears Governor el-Rufai hates Southern Kaduna with so much passion. He has insulted all our traditional rulers, our women, the youth, SOKAPU, and religious leaders. He has closed down our institutions, as far as projects and appointments are concerned, he does not see Southern Kaduna as part of the state. On top of that, he is now the person speaking for the attackers. A personality as high as the paramount ruler of Ikurama chiefdom, Dr Ishaku Damida, was for whatever reason arrested, detained, charged to court. So, many people have come under his hammer. I used to have great respect for the governor, but as it is now, it will be difficult to say that these expectations are being met. In my humble opinion, they have all been dashed. Is the deputy governor, Arc Bantex, no longer a member of SOKAPU? Honestly, I will like to begin with el-Rufai. I saw him as a cosmopolitan man, I saw him as someone who would bring a lot to the table. Usually, when a governor is elected, I score him a 100 per cent, and allow him maintain it till he leaves office. Unfortunately, my expectations of him have been dashed, and the same applies to Architect Barnabas, his deputy. This is a man the whole of Southern Kaduna had lots of hopes on. You recall when he was rated the best local government chairman in the whole country. This is a man who spoke so much for Southern Kaduna. I remember in the heat of the Sharia crisis, he went as far as declaring Southern Kaduna a ‘Christian State’ or so. We thought the man had the courage of his conviction at all times to speak and to do right. I admired him so much, even as a House of Reps member, I saw him as a hero. He was the General Secretary of SOKAPU. He was the one that designed the SOKAPU logo. But when he came on board and these issues started coming to the fore, he wanted us to organize a meeting of stakeholders. When we were discussing our various perspectives on the matter, I discovered to my dismay that his position had shifted, and he was shifting the blame of the attacks on the people of Southern Kaduna. A community like Ninte came under attack, no provocation, no justification, and 363 houses were destroyed. I called him, sent a text to alert him, and he never did anything until every house in Ninte went down. For someone to say it was the fault of Southern Kaduna people, I think it’s insensitive. In Nimte, no Fulani was killed, and even if that happened, was it justifiable to sack an entire community? He said the Southern Kaduna people do not like APC, and that they aggregated APC to be an Islamic party. I told him with great respect, you can’t bring religion and politics into this, because if it was in terms of that, we all know how and where to apply that. Whatever el-Rufai says, Bantex echoes. He was asked if the government was paying compensation to the terrorists, and he said it wasn’t true. It appears that Bantex is not the same person we knew; whether it is the lure of office that is motivating him to sell his people for a mesh of pottage, I do not know. The campaign he has been carrying on now is to break SOKAPU. I have heard that from him on good authority. I am afraid. I don’t know who is with him now. No one is in good terms with him now. They are now inviting the tribal associations to meetings in a bid to break SOKAPU. We will not be intimidated. We will do our work, whether SOKAPU breaks or stands. Let me state this clearly for the records. I am fighting a battle of principle, not just a Southern Kaduna war. If a Bajju man kills a Fulani without cause, I will fight the Bajju man; same goes for a Christian killing a Muslim and vice versa. We cannot be intimidated. If there is anyone who deserves to go to the International Criminal Court (ICC), we know. They are in government and not outside. One, government has to face reality and do its work. It is not supposed to be partial. It has a constitutional role to play, to protect lives of citizens. When the government decides to abdicate its role to become the spokesperson of the terrorists, it becomes tragic. I want to suggest that the governor sheds the toga of partisanship and wear that of a statesman, so that, everyone can be equally treated. Two, there is imminent humanitarian crisis in Southern Kaduna. People have lost their homes, and are now destitute, and yet, in the North-east, as soon as they were hit, IDP camps sprung up here and there. In Southern Kaduna, the opposite is the case. No single camp has been established despite our cries since July last year. No emergency relief materials have been brought to Southern Kaduna. NEMA only brought materials that could not cater for a single household, in the face of hundreds of houses destroyed. It is quite insulting and sad. No one needs to be told that Southern Kaduna needs a martial plan to arrest the senseless drift into a constant killing field. You cannot leave the culprits and go after the victims. The culprits have come out to own up to the attacks. The Miyetti people say its reprisal, meaning they know the people who are perpetrating the killings. The government should remove partisanship. The governor said the killers are coming from 14 African countries. If that’s true, it means Nigeria has a whole lot of problems with policing its borders. Can the government begin to police its borders? Can we review the ECOWAS protocol on transhumance into and out of Nigeria? Can we temporarily close our borders to those 14 countries? You come into our country to eat our grass, and kill our people, does it make sense to leave our gates open to you? Government should involve Interpol and other international security outfits because sadly in our case, the governor is paying compensation to terrorists. It means he knows them. Where was that money appropriated for in the budget? Again, the victims were not paid a dime as compensation. Even the Agwai’s report that el-Rufai always refers to recommended that all the people affected should be paid compensation. Also, community policing is necessary. We have told the people to explore all legal means to protect themselves, for which we have come under criticisms, and are being accused of inciting the people to take laws into their hands. There is civilian JTF in Borno. We need civilians to partner with government to root out the criminals from Southern Kaduna. We are also ready to dialogue with the killers, but that is only if the other party is ready to dialogue with us.